Casey grew up in Oskaloosa, Iowa and moved to Portland, Oregon for college where she attended The Art Institute of Portland and Cosmetology school. While in Portland she stayed active by hiking and surfing in the area. She met her husband there and moved to his hometown of Dubuque, Iowa in 2012. In her spare time, Casey enjoys going to concerts, camping, hanging out with friends and her dog Biscuit. She maintains a healthy lifestyle through staying active and chiropractic care. Since being adjusted by Dr. Jack and Dr. Jenny she has been experiencing fewer headaches and backaches, better concentration, greater energy and is more in tune with her body. Experiencing improved overall well-being helps her to continue being active and enjoy both life and her family to the absolute fullest. 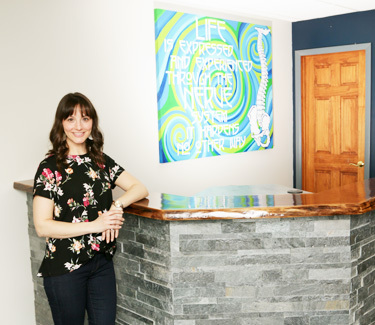 Casey is passionate about helping her community enjoy a better life through lifetime chiropractic care and healthy lifestyle choices. She looks forward to seeing you in the office soon. Sarah is a 2006 graduate of Western Illinois University, receiving her Bachelor of Science in Recreation, Park and Tourism Administration with a Minor in Management. She worked at the Rock Island Arsenal for six years, organizing and running events for school-aged children. After her marriage to Dr. Jack Hinderman, Sarah moved to Cedar Rapids, Iowa to work at Polk Elementary as a volunteer coordinator, organizing volunteers and running events for the school. 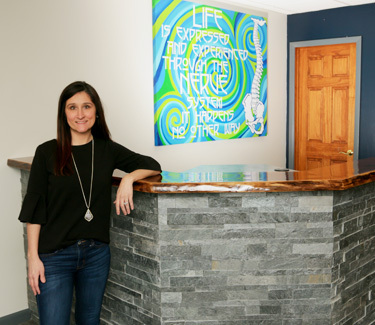 In October 2007 she moved to Dubuque to join her husband in establishing Family First Chiropractic Wellness Center. You will find Sarah behind the scenes as she stays at home caring for Dr. Jack and her four boys: Blake, Ian, Nolan and Hawkin. Sarah loves working on events in and out of the office for our practice members to enjoy and cannot wait to meet you at the next gathering or in the office waiting room.